The Winix 70 Pint Dehumidifier WDH871 is a high capacity dehumidifier for home use and capable of dehumidifying an area of up to 1500 sq ft. This appliance is suitable for use in living areas of the home and could also be used in a large bedroom or kitchen and would also be effective in a medium sized, finished basement. This dehumidifier is as well suited for use in a basement as any portable dehumidifier on the market. Nor only has it the power but it has all the conveniences you might wish for, including a built in condensate pump, an auto-restart feature and a 12 hour on-off timer, any or all of which may be of particular value in a basement dehumidifier. The WDH871 is an attractive unit, well suited for use in the main areas of any home and relatively small for a unit of its power. The unit is well featured for ease of operation and flexibility of use. This dehumidifier is not a power-hog and boasts an Energy Star™ qualification. The unit comes with five year warranty on the sealed refrigeration system and a one year limited warranty on the unit as a whole. The Winix 70 Pint Dehumidifier WDH871is identical to the Winix 50 pint dehumidifier in all but two respects. It is a little heavier, due to its greater power, and will extract 70 pints of moisture daily from the air. The water extraction rate will, of course, vary according to ambient temperature and relative humidity. The 70 pint figure was obtained in independent tests at the AHAM standard of 80°F and 60&RH and so can be reliably compared with any other dehumidifier which has been certified by AHAM. The unit is capable of controlling relative humidity in an area of up to 1500 sq ft (manufacturer's recommendation) and so is able to deal with a large room or rooms within the home. One area for which the Winix 70 Pint Dehumidifier may be considered is a small to medium sized basement. This unit is well equipped for such a task but before describing how well suited it is for this application it may be helpful to describe the type of basement for which it would not be suitable. If your basement is cool, below 55°F - 60°F, for long periods and/or the basement is very wet, with a degree of water seepage through the foundations for example, this unit would be less than ideal for the task. Such conditions require a heavy duty. purpose designed basement dehumidifier built to commercial standards. If a basement is sub-divided into a number of partitioned rooms this unit will be far less effective than might be expected unless doors are left open and the dehumidifier is supplemented by fans to achieve a circulation of air. For partitioned areas a ducted installation is neater, more effective and, in the medium to long term, less expensive. Since the Winix 70 Pint Dehumidifier is not configured for attachment to ducting it would, in our opinion, be less suitable than available alternatives for the task. The unit will, therefore, be most suitable for a relatively dry, finished or partially finished basement with few, if any partitions, where the humidity levels are high enough to be uncomfortable and there is a risk of moisture damage. For this purpose the features of this dehumidifier make it more suitable than most other room dehumidifiers. The capacity for continuous drainage is not unusual in a room dehumidifier. Most dehumidifiers can have a small bore, plastic hose attached to an outlet on the unit which will allow the condensate to drain to an outlet a few feet away by means of a gravity feed. Where a drain is not available near the centre of the basement, the ideal location for the dehumidifier, the position of the drain may dictate a site for the unit which is less suitable. The Winix 70 Pint Dehumidifier WDH871 is unusual in that it has an integral condensate pump which is powerful enough to carry the water a much greater distance horizontally and will lift the water as much as 15 feet vertically if the most convenient outlet is above the dehumidifier. A separate pump of similar power, if purchased separately, could cost from $40 to $80 and is an untidy solution compared with an internal pump. This factor may be borne in mind when comparing prices. Power outages are not common occurrences but they do happen. If a basement is used for storage and not visited every day it is easy to overlook the fact that the last power interruption will have switched off the dehumidifier. The WDH871 has an auto-restart function which reactivates the unit when power is restored and resumes operation at the chosen settings. This feature is also far from universally available in room dehumidifiers. The Winix 70 Pint Dehumidifier also provides the benefit of an adjustable humidistat which allows a desired level of relative humidity to be programmed into the unit. Once set the dehumidifier will monitor the relative humidity level and cycle the unit on an off to maintain it. This is essential in a basement dehumidifier which may be infrequently attended as it both preserves a stable level of RH and saves energy. This feature is commonly available in most room dehumidifiers. The last of the essential features is a low maintenance requirement. The only "must not forget" task is removal and cleaning of the air filter, about every two weeks. This is very important. Air-borne particles entering the unit can damage the components and degrade the dehumidifier's performance. A particular problem is caused by those particles adhering to the coils and so reducing their effectiveness that the dehumidifier is all but useless. The filter in the WDH871 is easily removable and is washable. Please do not forget this small chore, with any dehumidifier. The Winix 70 Pint Dehumidifier WDH871 is rated for operation within an ambient temperature range of 36°F to 99°F. The unit has an auto-defrost feature whereby the unit detects the build-up of ice on the coils and turns off the compressor until the ice has melted, aided by the continuing inward air-flow since the fan continues to operate. This is common-place in dehumidifiers and should not be taken to mean that this dehumidifier is ideal for low temperatures. At low ambient temperatures the down-time for defrosting can exceed the operating time as the air is not warm enough to melt the ice quickly. This accounts for our caution about cool basements. Other features of this unit include a programmable on-off timer, electronic controls with soft touch buttons and a digital display and a compact and stylish design that fits well with a living environment. While relatively few dehumidifier reviews have been written by consumers about this product those that are available are very positive. Like most large capacity portable dehumidifiers this model is most often used in a basement. It is reported to be a very effective unit, quickly reducing humidiity and maintaining the chosen level with no problems. The integral condensate pump is much appreciated and appears to be one of the critical factors in the buying decision for many users. We have not come across any negative comments about this dehumidifier although we must stress that the number of reviews available is small. 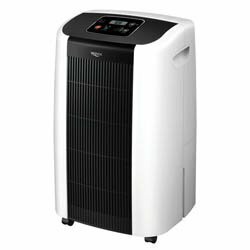 We regard The Winix 70 Pint Dehumidifier as one of the best, possibly the best dehumidifier in its class sold in the US market but manufactured outside the USA. It is a worthy competitor to the domestically made products which we rate highly, including Frigidaire and Danby dehumidifiers. This unit is more expensive than some of its rivals but offers the additional convenience of an integral condensate pump. If you need to drain the condensate continuously and cannot do so to a floor level drain this is a major advantage. If you had to purchase a separate pump this would cost at leat $40 and possibly as much as $80, as well as being a less "tidy" solution. The Winix 70 Pint Dehumidifier WDH871 is a well built and competent machine. With the pump and its auto-restart feature this is an ideal unit for use in a basement and we recommend it to our visitors without reservation.